What we now know as Halloween began 2,000 years ago as the Celtic festival of Shamhain in Ireland. “Samhain” is the Gaelic word for “summer’s end”. For farmers and rural folk, pagans (the original meaning of pagan was not that of our current understanding, as those who aren’t Christian, but simply those who lived in rural areas, by the rhythms of nature), the holiday marked the beginning of the Celtic New Year. It was the transition from the light part of the year to the darker months of the year. The day was celebrated starting on sundown on October 31st and then throughout the day on November 1st. It was beloved- and is still beloved by some- as a time when the veil between this world and the spirit world is thinnest, and departed spirits can return to mingle with the those of the living. Celebrants would dress up in costumes, representing the various Celtic deities. Part of the folklore contains a story that Samhain is when the old God dies and the Crone Goddess mourns him deeply for the next six weeks. The popular Halloween image of an old hag stirring a bubbling brew from a giant black cauldron comes from the Celtic belief that all dead souls return to the Crone Goddess’ cauldron of life, death, and rebirth to await reincarnation. The jack-0′-lantern, also has its roots in Celtic legend. Based on a folklore tale about a forlorn ghost named Jack, jack-o’-lanterns were set outside during Samhain to guide lost souls-and to scare away evil ones. The difference in the United States is that we use pumpkins. The Irish originally carved out turnips, but when they brought their tradition to America, turnips were much harder to come by than were pumpkins. In fact, they discovered that pumpkins worked better. Handing out candy on Halloween to our costumed guests at the doorbell stems from the Celtic tradition of giving food and money to the costumed celebrants, just in case they were the physical incarnations of lost souls. In addition, when the kids say “trick or treat”, it springs from the custom of doing things to please the spirits or else risk some evil. Around 700 A.D., when the Christian church began to spread throughout Ireland, the Church renamed the holiday All Saints Day (Nov. 1 precluded by All-Hallows Eve (Oct. 31st) and so it became to be known as Halloween. Like many other pagan festivals, the Christians adopted Samhain and made it a Christian event. While other places in the world celebrate Halloween, it is most widely known and celebrated in the United States, Canada, Ireland, and the U.K. So, while the light outside my window is already dimming at 4:30 pm, and my Halloween candy is at the ready for the throngs of trick or treaters to descend upon my doorstep tomorrow evening, I can relish the spiritual connection with my distant ancestors in the “old country” who marked this as a holy and sacred time AND revel with the all the kids who are simply looking forward to a bag full of candy, getting dressed up, and being out after dark on a school night. As always, the sacred and the everyday live side by side…it’s important to acknowledge both. ‘Sip it at the far end. What is it like?’ ‘Salt. He did as he was told but that did not stop the salt from remaining the same. “Thus, even though we cannot see it, Brahman pervades the world and as Atman, is found eternally within each one of us.” (Juan Mascaro’s translation, VI of The Chandogya Upanishad). The element salt has many used to illustrate well known spiritual parables in our Judeo-Christian traditions as well. In biblical times, it was an expensive and important commodity. It was used to barter, was widely traded, and used not only as a means to flavor food but even more vitally, as a preservative. Hence, it was widely understood as a metaphor for preserving the purity of the world, as well as being essential to sustain all life . The Hebrew Bible (namely Exodus, Ezekiel, and Kings) mentions salt as a purifying agent. While passages in Leviticus (2;13) and Numbers (18:19) present salt as a sign of God’s covenant . Salt itself, sodium chloride, is extremely stable and cannot lose its flavor, so that interpreting salt that has lost its flavor has been a topic of some debate. The most common explanation for this is that salt in the era was quite impure, not only due to extraction methods, but also due to unscrupulous merchants mixing it with other substances. Other scholars say that the writers are aware of salt not being able to lose its flavor and hence being the salt of the earth implies that the audience, once having heard the message, will always remember their value. The words translated lost its flavor translate from the Greek as became foolish, but the Aramaic for both phrases is the same, and so we must use our gifts, lest we lose our gifts, from lack of wisdom, complacency, or impurity. May you never lose and may you be worth your salt. 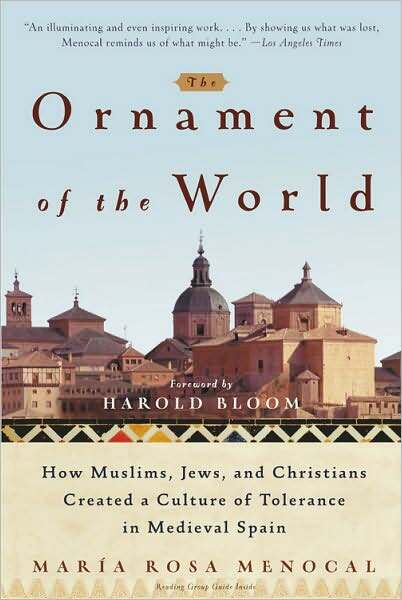 In 2002, Maria Rosa Menocal wrote a book entitled ‘The Ornament of the World’. I only just purchased and read it sometime earlier this year. It is an important book for everyone to read and understand. In light of the Ground Zero Mosque / Cordoba Center / Islamic Centre / Park 51 controversy in New York, one cannot but wonder, how far has the religionist of Islam drifted from the golden age of Cordoba. I do not know who she is, I have not heard of this writer until I read the book, but her historical documentation of the impact of the Umayads in Spain cannot be overestimated in its importance. The book triggered a deep longing and yearning for those ancient days and a terrible realisation of just how far ‘Muslims’ have strayed from the poetic beauty, sincerity, compassion, love and strength that once illuminated the ancient world. This made me happy and sad. Those people who are strapping grenades on naive men and women, those people who are tucking a cellphone bomb underneath the bus seat, those people who are called in the media as ‘Islamic Extremists’ or ‘Al Qaeda terrorists’ – They are just bandits. They are weak, doubtful, blind and desperate, and in their despair they hijack and slander the noble names of the Most Excellent Faith of Muhammad Habibullah. These ‘Muslims’ have become intolerant because they have cast their faith in a vessel of desperation. And for those who knows of the Prophet Muhammad, the Red Rose, the Sublime Humility, oh woe unto those who despairs, for they have raised their banner against the Beloved. Muhammad is anointed as the Mercy to the Worlds, yet they slander him as the Doom of the Worlds. They are worse than even the most wicked amongst non-Muslims, because they cloth their wickedness in the Beautiful Names of Islam.